History of La Paz Bolivia, Bolivia's De Facto Capital. Bolivian History. ESPAÑOL This is a detailed summary of the history of La Paz. 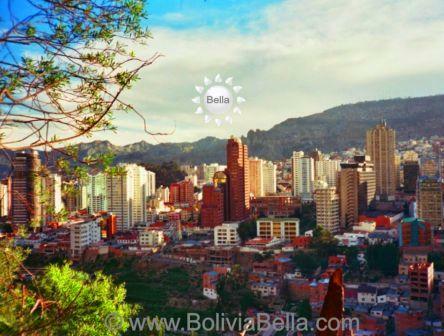 You can learn more about La Paz Bolivia by looking up information on points that are of special interest to you or asking questions in our La Paz Forum. Based on the results of archeological excavations, historians believe that a culture called the Tiwanacotas (or Tiahuanacotas) inhabited the Cordillera Real (Andes) region first. This culture may have been of the Aymara ethnic group and dates back to about 1500 B.C. (although some archeologists believe it may date as far back as 5000 B.C.) in the Valley of Pampa Koani, near Lake Titicaca. They also believe that this warrior tribe conquered and colonized the entire Lake Titicaca region, extending in the valley carved by the Choqueyapu River (in which the capital city of La Paz now rests), and through portions of Oruro, Potosí, Northern Argentina, and Chile. This pre-Incan civilization subsisted for a millennium and a half using advanced agricultural, lake navigation, and construction techniques, as seen from the ruins that they left behind. Later, although archeologists cannot explain why, the cities they inhabited were gradually abandoned and deserted. Their strange disappearance, near the 12th Century, has led to much speculation and many attempts at explanations, some of which are more plausible than others, including natural disasters, internal conflicts, etc., and others which are more extravagant, such as the explanation proposed by an English writer who believed the city of Atlantis had been located in the area occupied by the Aymara. The Incan period begins when the Quechuas, under the Inca Pachacutec, invaded the western and central regions of Bolivia in the 15th Century. In these regions the indigenous peoples still conserved their own distinct languages and customs. The latter were absorbed into the Quechua culture either gradually or by force, and used as slave labor if they refused to be conquered, and many were exterminated. The Aymara were categorized by the Quechua as vassals (“cayaos”) and were allowed to continue living their own lifestyle to a certain degree in exchange for their submission and the payment of a vassalage tax to the Inca of Cuzco, despite the fact that they tended to frequently revolt. The Quechuas, a Peruvian culture, considered themselves to be descendants of a couple called Manco Kapac and Mama Ocllo, of divine origin, who appeared on the Island of the Sun in Lake Titicaca and from whom the Incan lineage originates. Legends aside, what is known is that their culture appeared around 1200 B.C. in the Valley of Qosqu (Cuzco) and that they expanded over five of the countries that currently occupy the region. They conquered nearly half of Bolivia except for the Eastern and Southern areas and called their new territory the Qullasuyu (or Collasuyo). It (the portion that is now Bolivia) became one of the 4 “suyos” or comarcas into which they divided their empire (the other three were called Antisuyo, Cuntisuyo and Chinchasuyo). Collectively, all four “suyos” were known as the Tawantisuyo. This new “suyo” (now Bolivia) was governed by an “apo” (a territorial chief) who was based in Copacabana. The “suyo” was administratively organized into “ayllus” (communities), each governed by a “curaca” (cacique). They built some forts and cities in addition to a network of roads to articulate their new “suyo”, although they were not able to create a civilization of proportions equal to that which flourished in Peru because they concentrated more on extracting gold than civilizing the new territory. Just one century later they were conquered by the Spanish who dismembered the Tawantisuyo Empire. Despite being colonized first by the Quechua and then by the Spanish, the Aymara continue to be the largest ethnic group of Western Bolivia. The first Spaniard to explore what is now Bolivia was Diego de Almagro who founded a small town called Paria in the department of Oruro. It is presumed that the inhabitants of this town explored the rest of the altiplano (highlands) and a portion of Bolivia’s valleys. Almagro himself did not found any other cities as he was executed upon returning from his expeditions through Chile and Bolivia by a pair of rivaling brothers, Francisco and Gonzalo Pizarro. He died in Lima without heirs and a war began between Francisco Pizarro and the Spaniards who were led by his younger brother Gonzalo, and others led by Viceroy Blasco Nuñez y Vela. Francisco Pizarro was defeated and a captain called Alonso de Mendoza was instructed to found a city that would serve as a connecting point between the commercial routes that led from Potosi and Oruro to Lima. Mendoza selected an area where the town of Laja exists today and there he founded a city which he called Nuestra Señora de La Paz on 20 October 1548 in memory of the peace treaty between the followers of Pizarro and the royalists. However, just a few days later he headed to the valley of Chuquiago Marka where the Choqueyapu River ran, and saw that the waters contained gold nuggets. Also there were fields of potatoes and a more temperate climate. So he transferred his newly founded city to this new area and built the first buildings in a deep gorge to protect them from the cold winds that blew down from the Andes. This new city prospered more slowly than those of the Charcas and Potosí areas which were very rich in gold and silver, but eventually became the third most important city in the Audiencia de Charcas region, which was created by King Phillip the 2nd of Spain in 1559 and it soon became known as the Intendencia of La Paz. However, Spain wasn’t interested in increasing the prosperity of its colonies, preferring instead to exploit the many mines and ship the gold and silver they produced to Europe. The rigid Spanish class system enslaved the indigenous peoples and ignored the rights of mestizos (Spanish and indigenous mix) and poor creoles (Spaniards born in the Americas). In addition, wealth was unequally distributed, there was much bureaucracy, and Spain did nothing to improve conditions in the Indias (as the continent was known at the time) and this led to revolts early on. As early as 1661 the house of the Corregidor of La Paz was assaulted by a group of creoles who demanded their freedom and killed the Corregidor. But this rebellion was suffocated and those who led it were killed in combat. This did nothing to end the growing discontent. A century later another revolt took place, this time among the indigenous peoples. Their leader was an Aymara cacique called Tomás Katari who was able to expand the rebellion throughout the rest of the colony, but he died a short time later. He was replaced by his brothers who were defeated in the capital of the Audiencia of La Plata (today’s city of Sucre) and were executed. In 1780 another rebellion broke out, headed by another Aymara leader called Julián Apaza, better known by his war name: Tupac Katari. He headed an indigenous army, invaded the city of La Paz, and there was heavy fighting. He encircled the city hoping to cause its inhabitants to surrender from hunger, first for three and a half months and the second time for just over two months. He was also defeated and was taken prisoner by the Spaniard who executed him by quartering him (he was tied to four horses, each of which ran off in separate directions, thus tearing his limb from limb). After this there were no more rebellions until 1809 when a band of patriots, led by Pedro Domingo Murillo, joined freedom fighters from the Charcas region, formed a Protective Junta, and proclaimed their government independent. They took over the city’s military garrisons on the 16th of July of the same year but this revolt also failed. The revolutionaries were defeated by royalist troops commanded by Brigadier José Manuel de Goyeneche, who took them prisoner and condemned them to death. In January 1810 the nine who headed the rebellion were hung: Murillo, Catacora, Figueroa, Lanza, Sagárnaga, Bueno, Jiménez, Graneros, and Jaén. Goyeneche hunted down the rest of their men and, as was the custom, exhibited their heads on stakes in the main plaza of La Paz, to scare off any more attempts by revolutionaries. The fighting continued for the next fifteen years with both sides suffering defeats and enjoying victories. General Andrés de Santa Cruz attempted to expel the Spanish from La Paz in 1823 but was defeated and obligated to retreat to Peru. Only after the victories of Junín (by Simón Bolivar) and Ayacucho (by Mariscal Sucre) were the patriots able to finally cause the royalists to surrender. The colony was declared independent in 1825. In 1826 Bolivia’s first president Antonio José de Sucre, signed a constitution for the new Republic of Bolivar, and decreed the creation of the department of La Paz on 23 January 1826. However, he was obligated to abandon the government and leave the country due to discontent among the population of the capital of Charcas (Sucre). He was replaced by General Santa Cruz who unified the country with Peru under the Peruvian-Bolivian Confederation. This angered Chile and caused a war, first between the three countries, and then between Bolivia and Peru when Peruvian General Agustín Gamarra attempted to annex Bolivia. Gamarra lost to Bolivian General José Ballivián, the confederation was disbanded, and Bolivia was able to preserve its independence. A series of internal disputes between political, military, and civilian factions ensued and there were several coups and changes in presidents over the next few years. One of these de facto presidents, Hilarión Daza, led Bolivia’s War of the Pacific (against Chile) between 1879 and 1883, which Bolivia lost. By 1898 the dispute between the Liberal and Conservative parties led to a civil war between La Paz and Chuquisaca (Sucre) over which city would be the country’s capital. The crisis began to worsen in 1896 when Severo Fernández Alonso, a conservative, was elected president. Two years after his election he passed the Residency Law which stated that the president of the republic must live in Sucre and not in La Paz, as had been the custom because until then most of the presidents had been men born in La Paz. In fact, the law stated the president could not leave the capital city without permission. The Liberals rebelled declaring La Paz a federal region. Fernández Alonso marched to La Paz to squelch the rebellion but the Liberals, commanded by José Manuel Pando, started out to meet him and defeated him in the battle of Primer Crucero in Oruro. With help from the Ponchos Rojos (led by Aymara leader Pablo Zárate Villca) General Pando defeated the conservatives a second time in the battle of Segundo Crucero, also in Oruro. The conservative president was forced to resign. A triumvirate, led by Pando, formed a junta which governed for six months until a national convention was held in Oruro in 1899 in which Pando was voted in as the new constitutional president. He disbanded what remained of the Conservative party and his allies the Aymara because they had vindictive plans that were not convenient to him. This conflict is now known as the Federal War and is remembered in both departments (Chuquisaca and La Paz) because so many abuses and massacres took place and both sides blame each other. However, it is remembered mostly because La Paz won the seat of government and became the country’s virtual capital, leaving only the Judicial Branch in Sucre which even today, on paper, is known as the country’s constitutional capital. During the first few years of the 19th Century mining continued to be the axis of the national economy, although no longer silver and gold mining, but tin. Several important inventions were created during the Industrial Revolution, such as moving pictures, railroads, telephones, and others. Mining was primarily in the hands of three large families: the Patiños, the Hochschilds, and the Aramayos, who monopolized the industry until the mines were nationalized by the government of Paz Estenssoro in the 1950’s. The city of La Paz experiences noteworthy growth after the 1920’s, and became the main urban center of the country. Buildings and highways were built, along with the largest stadium in Bolivia. In the 1980’s the altiplano (the highlands where the city of El Alto now exists) began to become populated. The army was modernized by German military instructors and it acquired modern armament which was used during the Chaco War (between Bolivia and Paraguay between 1932-1935), although Bolivia lost and was unable to avoid losing another large portion of its territory. After the Chaco War, there were several decades of instability with military coups and weak governments. The military coups most remembered, because they were so bloody, are those led by coronels Hugo Bánzer, Alberto Natusch, and Luis García Meza. The second of these provoked the sadly famous massacre (in 1979) of many citizens who were shot by soldiers at point blank range on the streets. It wasn’t until 1982 that democracy returned to Bolivia under president Hernán Siles Suázo. During recent years La Paz has been the protagonist of some of the worst battles between the population and the police. Due to its geography, La Paz is a complicated city to defend when it has been surrounded: there are few access roads into the gorge in which it was constructed and this goes against it when the city needs supplies during conflicts. During the social convulsion of the 1990’s and even today, groups that wish to twist the government’s arm can easily do so simply by encircling the city. This happened during the first term of president Gonzálo Sánchez de Lozada, who privatized several state-owned companies to the great discontent of the opposition, and during the Bánzer and Quiroga presidencies. It happened again during Sánchez de Lozada’s second term as well. The most serious convulsion of this decade has come to be known now as the Gas War and Black October, and took place in 2003. Civilians and police, aided by the military, fought for months and dozens were killed, costing Sánchez de Lozada his presidency. During the government of his successor, Carlos D. Mesa, a hot dispute began between La Paz and Santa Cruz over the issue of departmental (state) autonomy in which other eastern states and the state of Chuquisaca, which hoped to recover its position as capital city, supported Santa Cruz. Despite opposition from La Paz, the five states (Pando, Beni, Santa Cruz, Tarija and Chuquisaca) voted for autonomy and current president Evo Morales was forced to include their autonomy in the new Bolivian Constitution which was approved in La Paz. The remaining four states then also voted to become autonomous in April 2010.